4. Move units "out of system"
When trying to clean up your inventory count, you may find that some units continue to persist in the Committed column and do not clear out when you update the Starting Inventory value. This simply means that these Committed units are still sitting in Orders that have not yet been set to Exported. You can tell because the units in the Committed column don't have matching units in Exported. Even if you recall Exporting all of your Orders, it's possible that some may have been missed. Find the Product on the Products page, click the "Order" button, and select "Search Orders". See Search Orders by Product for more info. You will then be taken to the Orders page, with a filter applied to show only the Orders which contain the selected style(s). 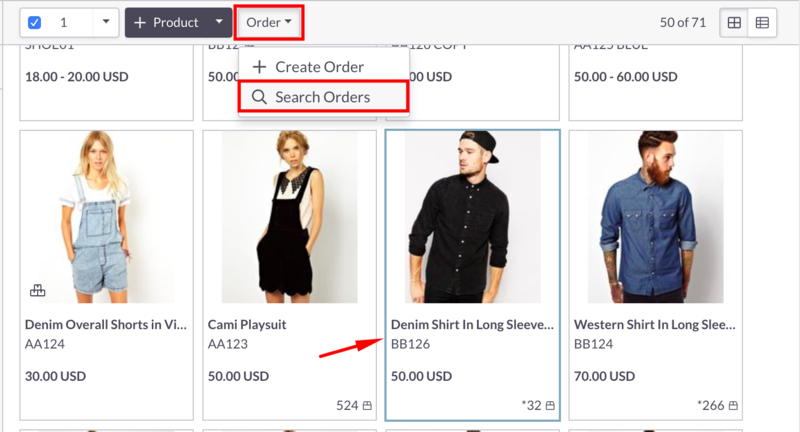 To narrow down your search to just the relevant orders, use the Filter panel on the Orders page. Click the Export Status button of an Order and select "Exported." Select multiple Orders by checking their checkboxes or click the Select All button in the toolbar. Then click the Status dropdown and select "Set as Exported." A confirmation message will appear when the Orders are successfully Exported and their Export Status labels will be green. Now, when you return to the Product's inventory table, you will see that the Exported units match the Committed units. These units are now ready to clear the table the next time you go to update your Starting Inventory.